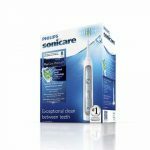 The Philips Sonicare Flexcare Platinum was introduced last year and has proven to be a great electric toothbrush. It uses a dynamic cleaning technology that removes plaque between the teeth and along the gum line efficiently by driving fluid between the teeth. It has 3 different brushing modes: clean, white and gum care. Combined with 3 intensity settings (low, medium or high), the Flexcare Platinum has 9 brushing modes. The gum care mode is clinically proven to reduce gingival bleeding as well as inflammation in just 2 weeks time. The brush’ bristles are extra-long so they reach far between the teeth and the gum line, reducing plaque up to 7x more than manual brushing and polishing your teeth for an extra smooth feel. The Flexcare Platinum comes with a charger and traveling case. 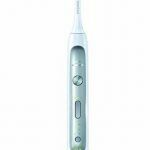 The Sonicare Flexcare Platinum has an intelligent Pressure Sensors, which detects when the user is brushing too aggressively. The handle vibrates gently to inform the user that too much pressure is applied. This prevents damage to the gums and diminishes erosion. Flexcare has built-in timers that instruct you when to switch quadrants and when your 2-minute brushing session has been completed. 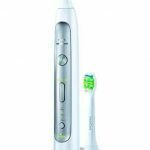 The Philips Sonicare Flexcare Platinum is an excellent sonic toothbrush, that has some great innovative features, such as the pressure sensor and timers. It is very quiet while active and can run up to 3 weeks on its battery, which makes it comfortable to use.